Venerating Peter’s chair or bones might seem a peculiarly Catholic habit, but even today people of all faiths when talking of the afterlife, imagine St Peter as gate-keeper of ‘the pearly gates’. That idea, of course, goes back to tonight’s Gospel (Mt 16:13-19) and a long subsequent tradition about the papacy as rococo as the Chair. As a result, some hang on the Pope’s every word, ready to be inspired by the smallest gestures; others buck against his authority, pinning on the Pope and Vatican all their gripes against God, the Church, themselves. Our first reading, from what might be described as the first papal encyclical, offers something of a corrective (1Pet 5:1-4). St Peter tells his fellow elders to be wise leaders, good shepherds and faithful witnesses, and it is to those three tasks for our new Bishop that I would now like to turn. “Lead by example rather than diktat,” St Peter suggests tonight. When the great Carmelite Reformer and Doctor of the Church, Teresa of Avila, heard of the death of a Provincial, her immediate reaction was to fear for his salvation, because he had been a superior for twenty years. Well, Greg Homeming has been prior or major superior in his Order for much of the past twenty years and now has two more decades of leadership ahead, so I suspect St Teresa would be doubly worried for his salvation! It was more than enough, she thought, to be responsible for one’s own soul, let alone a whole convent, province or diocese of souls. Yet leadership was to be her lot, and it is recorded that Teresa embraced each new task God gave her with fierce determination, quickly making friends, recruiting vocations, identifying opportunities, sweeping away obstacles. We can look forward to such from her son and he will be graced with the support of Teresa’s daughters at the Goonellabah Carmel. If Bishop Greg will not be the first Carmelite in these parts, he will not be the first Chinese either. Thousands came to the upper Clarence in the 1850s in search of gold. There were at least six Chinese mining settlements, known as Chinatowns, as well as a sand mine at Chinamans Beach. Once the gold was exhausted, they turned to market gardening in Murwillumbah and North Lismore, banana planting on the North Coast, shop-keeping in Byron, Ballina and Kyogle, and gambling and opium dens here in Lismore, which I’m reliably informed the new Bishop will not be reactivating. 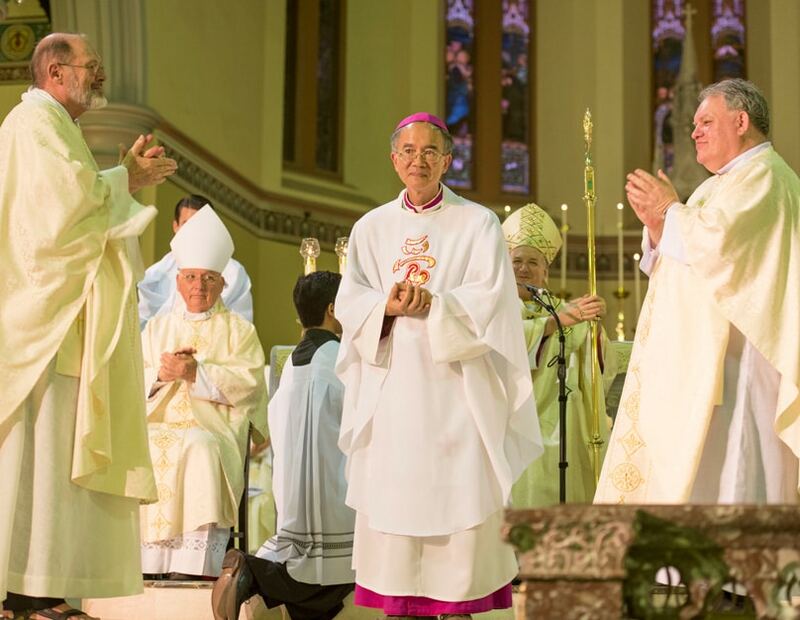 As our first Chinese-Australian prelate, Bishop Homeming is a sign of the changing face of the Church in Australia. And his priests can look forward to him demonstrating for their benefit the culinary skills of his beloved parents and the Chinese people! “Be the shepherd of the flock entrusted to you, watching over it,” St Peter charges Bishop Greg tonight. The Good Shepherd, Christ explains, knows his sheep and they know him; he guards and protects them from the wolves of falsehood; he leads them to safe pasture and would lay down his life for them (Jn ch 10). In our Gospel tonight we heard Christ before His passion commissioning Peter to be bedrock for the Church (Mt 16:13-19); but at the end of the Gospels Peter is re-charged by Christ (Jn ch. 21), this time to tend the sheep and protect the lambs. Mention of ‘the lambs’ leaps out at us at this time of the Royal Commission’s scrutiny of the Catholic Church. There can be no doubt that many episcopal, priestly or religious shepherds failed in the past to protect the lambs of Christ’s flock as they should. Some betrayed the mission given them by Christ and the trust given them by His people. At this time the Catholic community and especially the bishops hang their heads in shame, in apology, in determination to ensure such failures do not happen again. Some might think this is no time for making new bishops; I sympathise with their disenchantment. But there is a providence in God calling a man like Greg, with his legal background, critical intelligence, spiritual wisdom, pastoral sensitivity, and gentle soul to help lead us forward at this time. We need such humble and compassionate shepherds if we are to regain people’s trust after this ‘dark night of the soul’ of the Church in Australia. St Peter says the new bishop’s task will be to watch over the flock of Lismore “not just as a duty but gladly”. There are good reasons to think he will indeed be glad: there are some fine priests in this diocese and there have been a good number of seminarians and ordinations here in recent years; much has been done to ensure the spiritual formation of teachers and lay leaders; and this place for his chair has been beautifully restored. Bishop Jarrett has often remarked on the solid faith of the people, as he made his way from Alstonville or Belligen to Casino or Coffs, through Coraki or Kingscliff to Maclean or Mullumbimby, from Nambucca or Port Macquarie to Tweed Heads or Wauchope. In those places and beyond Bishop Greg will meet many causes for glad service. And so, Bishop Greg must be a wise leader, a glad shepherd and, finally, an authentic witness to Christ. Blessed Paul VI said that “Modern man listens more willingly to witnesses than to teachers, and if he does listen to teachers, it is [only] because they are [authentic] witnesses … The Church will evangelise the world by her living witness of fidelity to the Lord Jesus – the witness of poverty and detachment, of freedom in the face of the powers of this world, in short, the witness of sanctity.” What this friar brings to the Diocese of Lismore and the episcopate in Australia is precisely this witness of poverty, detachment, freedom and sanctity. It was a 13th-century bishop, St Albert Avogadro, who united the hermits of Mount Carmel in the Holy Land, writing a religious Rule for them that kick-started Carmelite life as we know it. His vision was of a life of gradual conversion and progressive ‘allegiance’ to Christ through that loving conversation with God we call prayer and that wise recollection amongst all the busyness of life we call contemplation. Ever since the friars and nuns have served, as St Peter exhorts, “not for sordid money, but because [they] are eager to minister”. Thus this humble religious has few possessions beyond his religious habit, his wok, and that passionate love for the spiritual theology of Teresa and John of the Cross which he has so often shared in retreats and spiritual direction. 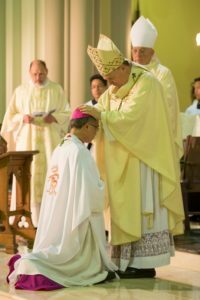 These few possessions are gifts he brings to this diocese and I know he will receive many spiritual gifts here in return.